If you are a Patreon Supporter, I have put together a video about 30 questions about psychology and video games that I wish academics studying games would answer (or answer better). 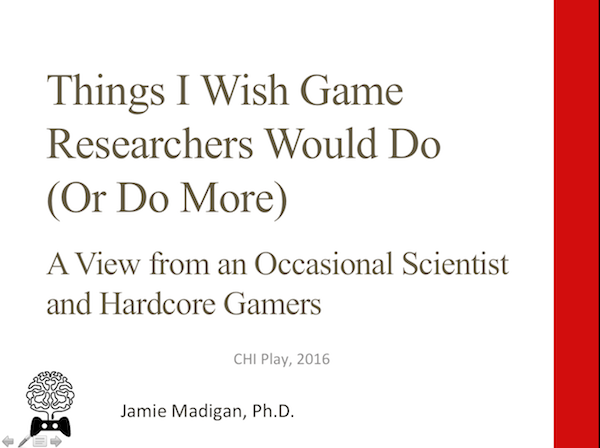 This is a 47 minute long version of the keynote talk I gave at the 2016 annual Symposium on Computer-Human Interaction in Play (also known as CHI PLAY). Just click the image below to go watch it. Or, if you’re not one of my many Patreon supporters, you can find out how to become one here. ← Do Non-Player Characters Count as an “Audience”? Those are great questions. I guess gaming companies have answered some of them through research and data crunching, though I wonder how many shared their findings with the scientific community. This has probably already been examined, but I would be very interested to know if the way players make moral choices in video games could be used to identify or predict future criminals. I know from experience playing modern video games that even though I am fully aware that my actions in a game have no impact on any living being, I am uncomfortable playing the role of the “bad guy” because I empathize with the characters in the game. What percentage of an “average” population would choose the “bad guy” path over the “good guy” path compared with a population of known violent offenders? If there is a significant difference in the percentages, could video games with certain moral choices or play style options be used as tools to warn psychologists of potentially dangerous future behavior? This would be a bit Orwellian if the subjects were not informed of the testing process, but otherwise, it would not be much different than other tests.